April 14, 2006 | NEWTON -- For the founders of this small agricultural community, "keep your feet in the furrow" meant adhering to the precepts of faith, hard work and love of family. It's a message a group of Newton women want to preserve and display for future generations through a historical sculpture. Members of the Benson Camp of Newton's Daughters of Utah Pioneers decided a piece of historical artwork was needed as a tangible reminder of the founders of the community. "Our purpose is to preserve history," says DUP Captain Ilda Berge. Last year the group called on the talents of local artist Marion Haws to sculpt a statue depicting a scene from the town's founding. They originally wanted a statue with a farmer, a pioneer and a railroad worker, but Haws already had a completed sculpture that "was just perfect for our agricultural beginning," Berge said. 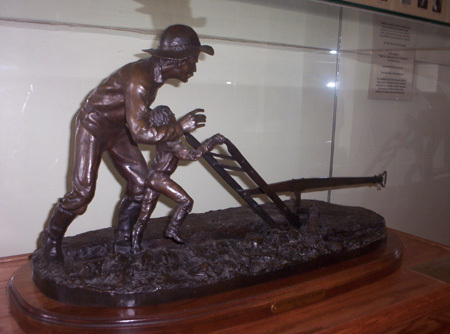 The 16-inch tall by 28-inch wide bronze statue depicts a man teaching his young son to plow. Haws found a 150-year-old plow at the Jensen Historical Farm in Wellsville and fashioned the statue in perfect scale, Berge said. Haws titled the piece "That's it, Keep Your Feet in the Furrow." Upon finding the sculpture, "We just immediately went into action," Berge said. In order to purchase the statue from Haws, the DUP raised funds by collecting aluminum cans, selling personalized Easter eggs and Valentines, and raffling off a quilt made by Newton Postmaster Carol Jensen. Some anonymous donors also came forward. The DUP presented the statue to the town at the 24th of July celebration in 2005. "There is love of family and faith in knowing that when we plant we have hope and a realization of the harvest," Berge told the crowd. At the celebration, Berge read a brief life history written by Haws. He began his first oil painting at age 12 and attended Brigham Young University. He has taught art lessons and has had several exhibits. It wasn't until last week that the statue received a permanent home at Town Hall. At the opening of the council meeting, Berge directed audience members, which included several members of the DUP and relatives of Haws, into the hall where the statue was unveiled. It was complete with a wood stand and glass case constructed by members of the community. Mayor Clair Christiansen said he considers the statue a tribute to the community and thanked the DUP for their efforts in obtaining it. Haws was unable to attend the unveiling due to illness. For their latest project, Newton DUP members are researching homes in the community dating from the town's founding in 1869.